After Ferdinand’s extraordinary long reign, his son Francis I, King of the Two Sicilies, reigned for a very short period, five years only, and perhaps he was the least important king among the sovereigns of the Bourbon family of the Two Sicilies. Born in Naples on 14 August 1777, he died in that city on 8 November 1830. In 1778, due to the death of his elder brother Charles Titus, he became the Crown Prince and Duke of Calabria. In 1797 he married Maria Clementina, Archduchess of Austria, daughter of Emperor Leopold II, who gave him a daughter, Carolina. After the death of Maria Clementina in 1801, he married Maria Isabella of Spain, daughter of King Charles IV of Bourbon. 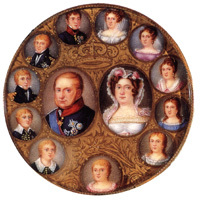 She gave him twelve children and some of her daughters married other sovereigns. In his youth he was surely conditioned by his mother’s strong personality; only when he moved to Sicily – due to the fact that the continental kingdom was occupied by Murat – could he start to show his personality. In fact, those were difficult years and the Court was influenced by the British, especially by Lord Bentick, whose policy fully opposed that of Maria Carolina to the extent that Bentick succeeded in convincing Ferdinand to exile his wife, leave the govern to his son Francis and appoint him as his vicar. The myth of Francis liking for liberalism originated in that period. In fact, he granted the Constitution of 1812 in Sicily, but we have to bear in mind the difficult situation of that time: in those years the British played the lords and masters since they were helping the Bourbon to fight Murat and also because they were supported by the autonomist Sicilian aristocracy. In November 1813 Bentick left the island; Ferdinand, back in Palermo, resumed the control of the situation, but left Francis as his lord-lieutenant while he went back to Naples after the fall of Napoleon. The Duke of Calabria remained in Sicily until 1820, the year of the constitutionalist Carbonari risings; in fact his father called him to Naples to give him the regency while he was travelling to Ljubljana to meet the Holy Alliance and ask their help. Francis apparently came to terms with the revolutionaries and accepted the constitution, but only to take time and see the evolution of the general situation in favour of the Bourbon cause. When his father died in 1825, he ascended to the Throne; he was 48, no longer in his prime. Basically, he was a pius and calm person. Just after his ascension, he gave amnesty to deserters and traitors. Then he commuted life imprisonment into hard labour, reduced prison sentences, but not to those convicted for robbery. He granted audience to everybody, as far as possible, and he tried to meet people’s needs. He and the Queen made a journey to Milan to get the Austrian forces – present since 1820 – to leave the Kingdom, which happened in 1827 and brought great economic benefit to both govern and citizens. When his son, the Earl of Trapani was born in 1827, he gave full amnesty to all prisoners (including political prisoners, and commuted capital sentences given to some Carbonari and conspirators) and all deserters and those who had refused to serve in the Army. Usually we consider Charles as the first King of Naples from the Bourbon dynasty. He is, of course, the great restorer of the Kingdom, but not the first King to reign over Southern Italy. In fact his father Philip V became King of Naples when he ascended the Throne of Madrid in 1700. During the events of the long War for the Spanish Succession, it happened that in 1707, Philip – though being the winner of the war and therefore lawful king of Spain – lost the vice-royalty of Naples to the Habsburg who kept it until 1734. In that year Charles of Bourbon, son of Philip V and his second wife Elisabeth Farnese, conquered the vice-royalty of Naples thanks to the diplomatic help of his mother, took the title of Charles King of Naples, restored the autonomy of the Kingdom and transformed it into an independent and sovereign State. Charles built new vessels, established insurance companies to foster maritime trade, protected and improved the industrial sector (he established rewards and biennial exhibitions) and fostered the creation of a clothing factory that provided jobs for thousands of people. He ordered the prisoners to work at the factory and they could redeem their prison sentences through an honest work. He also signed a commercial treaty with Turkey to obtain the transit through the Dardanelles for the Neapolitan vessels. Despite the difficult economic situation, he fostered agriculture, drained lakes, built the Ponte de’ Gigli (Lilies Bridge) near Maddalena Bridge, erected the Town Hall with 800 rooms and 40 alleys, constructed roads, resumed with promptness excavations at Pompeii, encouraged the study of Herculaneum papyri and promoted the opening of dance and design schools, constructed hospitals, established an orphanage in Palermo and the Order of Knighthood of Francis I, a meritocratic order granted only to those who had acquired civil, military and cultural merits. Unfortunately he too had to face revolutionary risings especially in the Cilento region, which he easily and harshly put down, also because they didn’t get any popular following. Before his death, he healed up the Sicilian economy. Giuseppe Coniglio wrote: «It was a useful provision since it established taxation and gave the people the certainty that it would not be increased at least for a decade» [G. Coniglio, i Borboni di Napoli, Corbaccio, Milano 1999, p. 327]. He also tried to assure the Throne of Athens to his second son, but only if the Greeks had allowed him to keep his Catholic faith or the Pope had given him a special dispensation. But then it all ended. He died just when revolutionary risings shook Europe over again, in 1830 (the year in which the French branch of the Bourbon lost the Throne). He left a difficult heritage to his young son, then aged only 20. But his son showed he was up to the task.